During one of Aquaman's coolest scenes -- right before a swirling, operatic mid-ocean trident duel between the once and future king of the sea and his nefarious rival -- as the camera pans around the giant amphitheater full of Atlanteans screaming for blood, one shot lingers, just for a few seconds, on a great big octopus playing a rousing drumbeat with his eight dexterous arms. 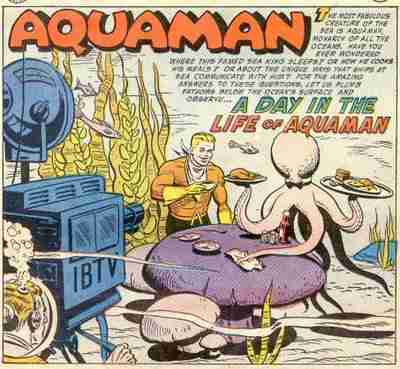 Even though it never appears again, the creature was some fans' main takeaway from early Aquaman screenings. Is it an Easter egg? 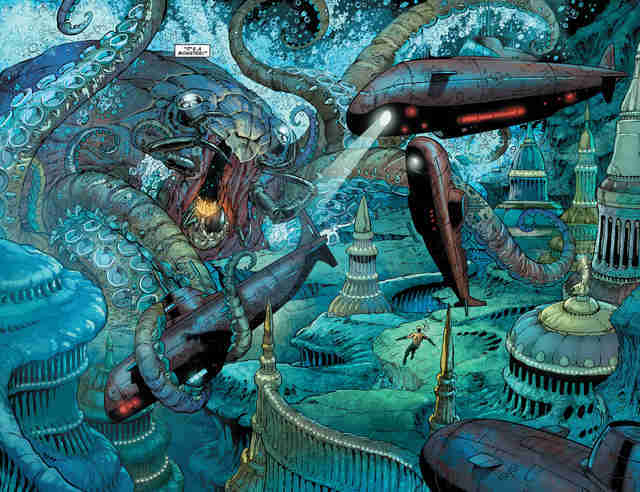 Is a giant octopus absolutely ripping on the bongos something director James Wan added in for some atmosphere? Who is this many-armed musical cephalopod? "A lot of people are kind of blown away by how strange and weird that is," Wan said when asked about the creature. "It's in the comic book! It's a fan favorite in the comic book, his name's Topo. Go Google 'Topo' and you'll see how funny that character is." 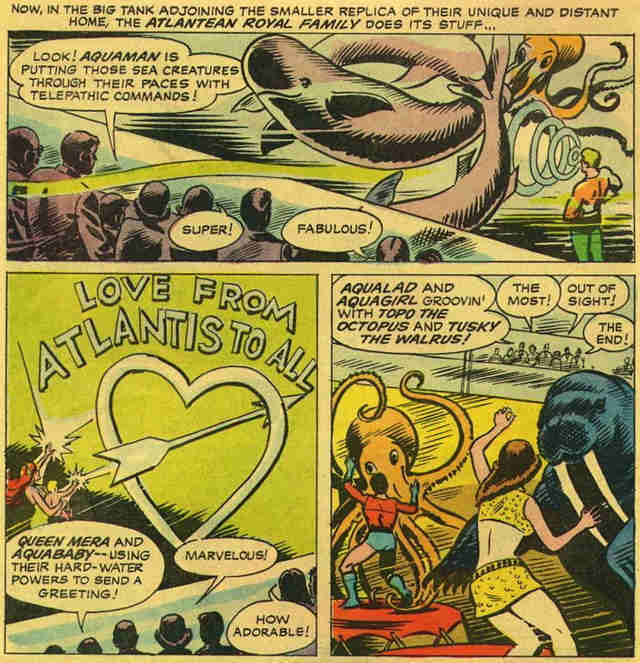 Topo was created by Aquaman artist Ramona Fradon, and first appears in Adventure Comics vol. 1 #229, which was published in 1956. He was born in or nearby the oceanic metropolis of Atlantis, and became Aquaman's beloved pet and helper, occasionally showing up to assist the superhero on his missions. For many fans, Topo hearkens back to an era in the DC Comics universe that was mostly very silly. There have been a couple other versions of Topo through the years. Recently, in Aquaman: Sword of Atlantis, he was given a more humanoid form, with arms and legs, though he still had a distinct octopus look. This design was referred to as "Topo II" and didn't have any familial relationship to the original Topo. He even shows up in a Young Justice episode modeled after the comic book arc he first appears in, in which he helps Aquaman and Mera escape the underwater city of Sub Diego and the clutches of the villainous Black Manta. DC Comics further weirded out fans by bringing the original Topo back again -- with a bit of a twist. 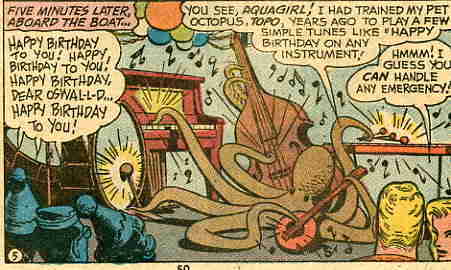 Instead of a friendly gray bow-tie-wearing octopus, this version of Topo, appearing in the rebooted New 52 timeline, was a terrifying octo-crab hybrid from the deepest depths of the ocean that Aquaman summoned with his magic conch shell. 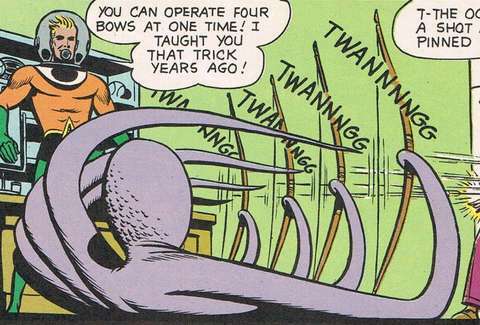 Topo agreed to help him fight the Scavenger, but ultimately he was too intelligent and powerful for Aquaman to control. 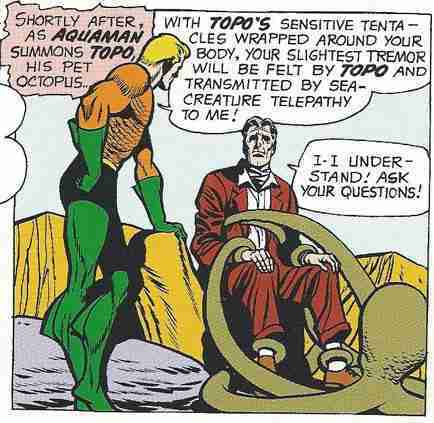 Given how much other stuff Aquaman the movie has to get through, there wasn't room for Arthur and Mera to have their little eight-armed buddy help them out on their adventures, but here's hoping, given Topo's early popularity, that he gets something to do in the sequel. Maybe he can bring the newly crowned king some breakfast in bed? Keep your fingers (and whatever appendages you have) crossed.